which means you can use CSI:360 from anywhere, any time and from any Mac or PC. You start by taking (4) shots at 90-degrees apart of any crime scene. When stitched together, this captures a complete 360 X 360, floor to ceiling panorama. Upload your JPEG panoramas to the CSI:360 server and you can link the views together, add yellow evidence markers and field notes with just a few mouse clicks. Nothing else out there is better or faster at recreating crime scenes better than CSI:360. CSI:360 takes less than 2 hours to learn. This includes learning how to take the 360 X 360 panoramic shots, stitch them, and upload them to your CSI:360 cloud account. Point, click, drag and save. 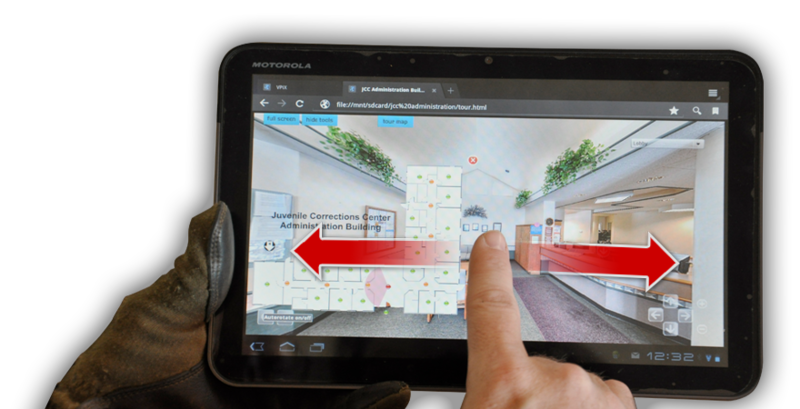 Your crime scene has hot spots, crime scene notes, yellow digital evidence markers and floating maps and floor plans. The District Attorney's office will think your detectives "walk on water." Host with Rackspace or Your Own Data Center. Create your CSI:360 account instantly with less than 1 hour spin up time of your account. We also offer complete server hosting solutions at Rackspace or we can remote install a CSI:360 server onto your server hosted at your own data center. Learn more and get an instant quote today. 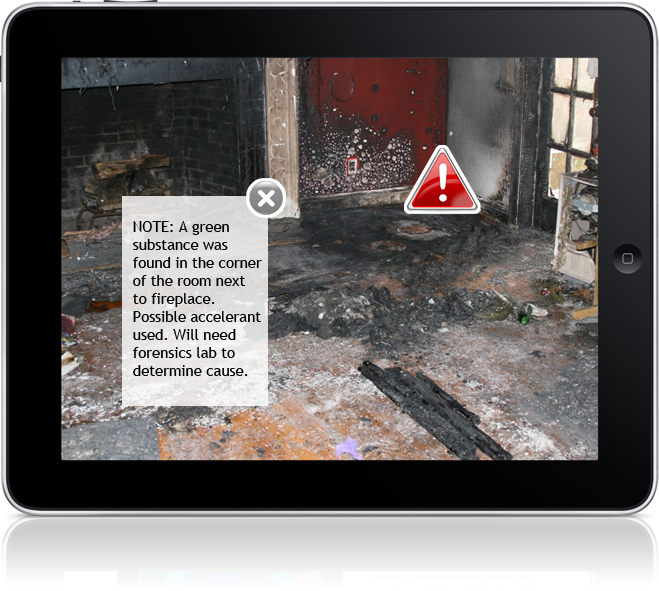 Thanks to Apple's recent announcement of iOS7 and improvements to HTML5, VPiX CSI:360 has upgrades that help train new fire-arson scene investigators. For example, now you can add animated flames, and colored smoke to any tour to create an interactive and educational tool designed to teach basic fire-arson scene investigation. We never expected CSI:360 to become a runaway success as it has become. CSI:360 is a tiny but growing division of Virtual Pictures Corp. (VPiX®) -- a Colorado "C" Corporation. VPiX is used by real estate brokerages, the hotel and hospitality industry and vacation property management. Since 2011, CSI:360 became the preferred add-on system to police and law enforcement agencies for recreating crime scenes, government building documentation, public schools and universities, the U.S. Military, Fortune 500 corporations and private security firms. Learn more and contact us.